I've never seen a yellow rubber band belt. Is it good or cracked and rotted? 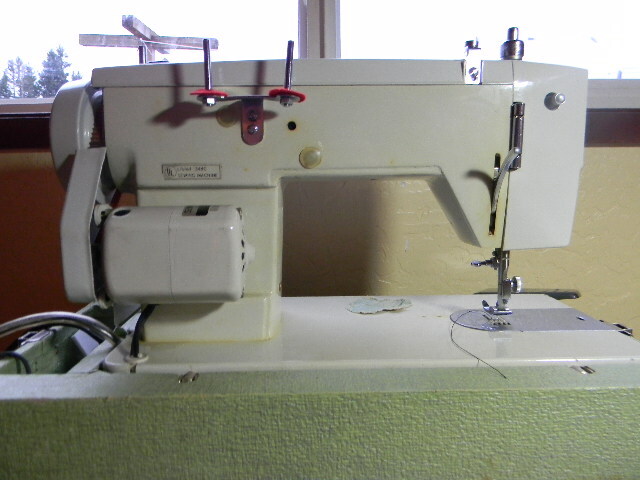 That poor machine, why people let their sewing machines get in such condition is beyond me. They make wonderful things on clean material with filthy machines and somehow expect the end products to be nice and clean too. Amazing logic. Some of those old Japanese machines turn better than the old Singers. Singer had a better reputation at the time. I think there was a lot of prejudice against Japan because of the war. Any you might look to see if any of your Singer machines were made in Japan. I'm not sure about the 293 - I will look at it some more today. Last night I pulled pics off my archives to post. Somewhere think I had a pic of a pretty pink Brother zz machine. Joe, a lot of women smoked and sewed at the same time. When those machines go into storage, they don't age any better than the women who were smoking. Some times storage is what gets the machine looking bad, - the foot control rattling around scratches up the whole thing pretty bad. So sad. This is the black version. SS only of course and one of my favorite machines. there is no other markings on this machine. 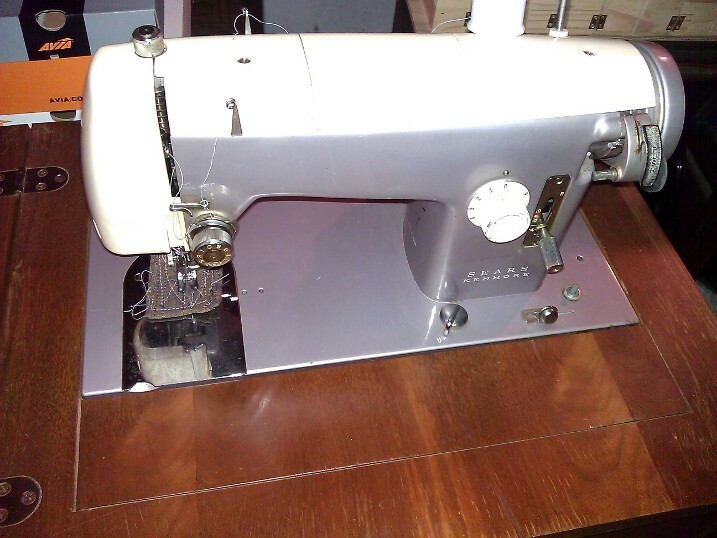 Oh, and with the exception of the stitch length regulator which is reminiscent of the Singer Model 15, the SEWMOR 404 is pure Singer 66 underneath. I am sure that the machine had not been used for years and sat in a garage for a very long time. It is possible that the previous owner gave up on it because when I first test drove her the top thread kept breaking. I finally figured out it was likely the ZZ stitch plate which had lots of jagged edges from needle strikes. Got a new one yesterday from the OSMG and solved the problem. As for the yellow belt, I should have mentioned it in my post. I have never seen one either but it is in perfect shape. I am thinking the the original one was white as the bobbin tire is white. It will have to be replaced as it is hard, dry and has a flat spot on it. Too bad it will be a black one, can't find bobbin tires in any color other than black. I can't see the badge clearly in your pic, but the one I took in August is readable and says 404. Bobbin tires are like Ford Model T's. You can have any color you want as long as it's black. your camera serves better than my feeble memory. Oh Yeah! I've been toying with an idea I haven't told anyone about yet. 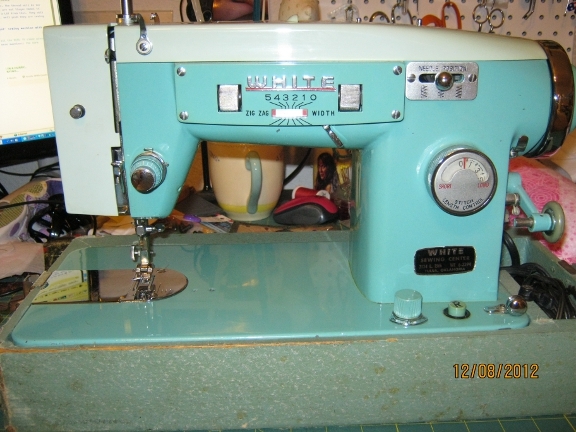 Since I like the Singer 66 but prefer a back tack or reverse, and the 66s with a back tack don't have a stitch length lock, I've been thinking about putting a SEWMOR 404 in a treadle. Not my black one, cos it works great and I don't wanna take a chance on messing something up. 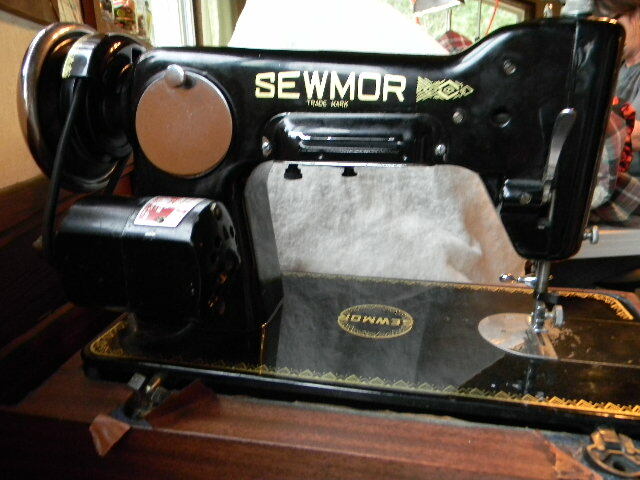 Sewmor 606 straight stitch, serial number S30828. This is a mystery machine as to who made it. There are not any JA numbers stamped on the underside. The motor is a Dayson Power Motor, 115V/.05 HP. Last edited by Caroline S; 12-08-2012 at 08:56 AM. and the last of my vintage zigzags, my mother's White model 1563, sn 3885. 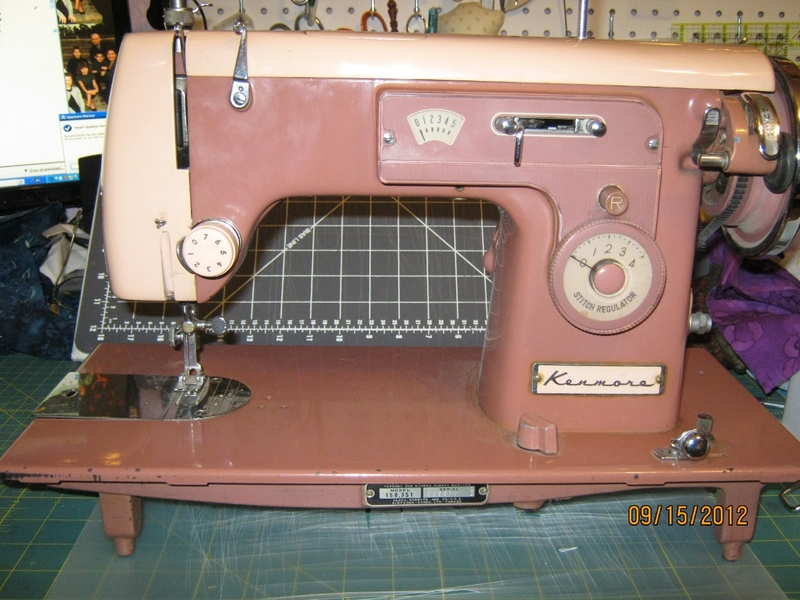 This machine includes manual, attachments, and complete set of cams for "fancy" stitches. 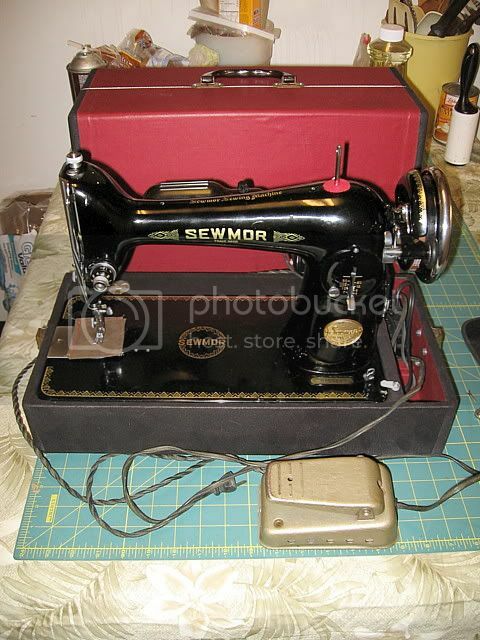 You better keep that SEWMOR 606 away from me. I'll stick it up under my shirt and make off with it. It's a perfect match to my S M 404. OK, I'll play! First I have this great DeLuxe Emporium 146 B. Made around 1968 I think. Left needle. Zig Zag and automatic buttonholer. Quiet, strong and sews like a dream. It's taken over as my "downstairs" machine. I hate having to run up and down stairs just to make some quick stitches. I also have a few Kenmores, but my favorite is this 158.523. With all the cams and a groovy box of attachments. Suzie Sewmor is now in hiding from Joey. 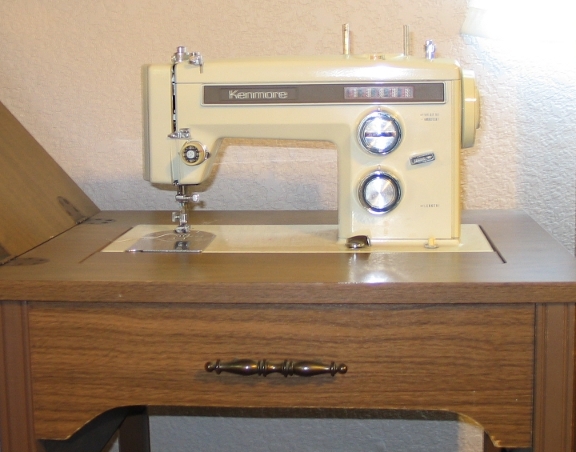 She is one very nice and strong sewing machine. 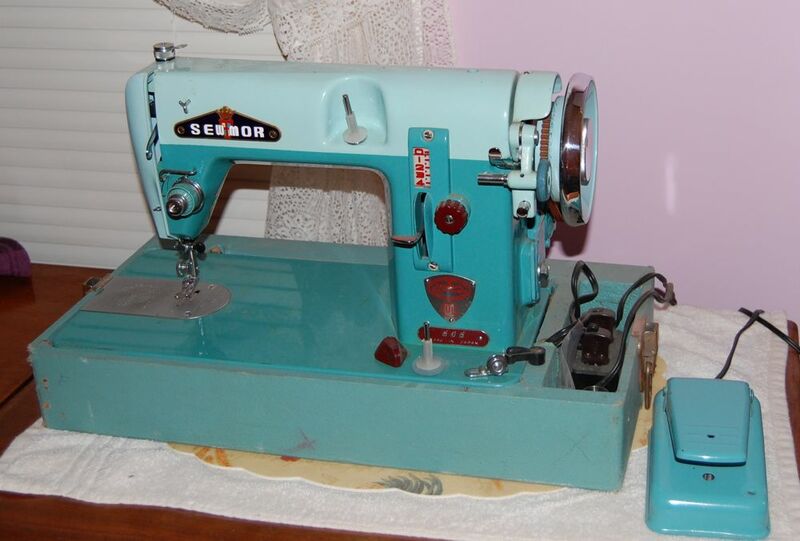 All of the searches that I did on her model number came up with another type of sewing machine. The plates does say 606 on it. But nothing on her tells me who the manufacturer was. She is sort of a hybrid between Singer, Brother and Necchi. When I was researching my 404 I came across that same comment about the 606. Seems there was two different machines with the same model number. I have no idea where I found that, but if I come across it I'll let you know. 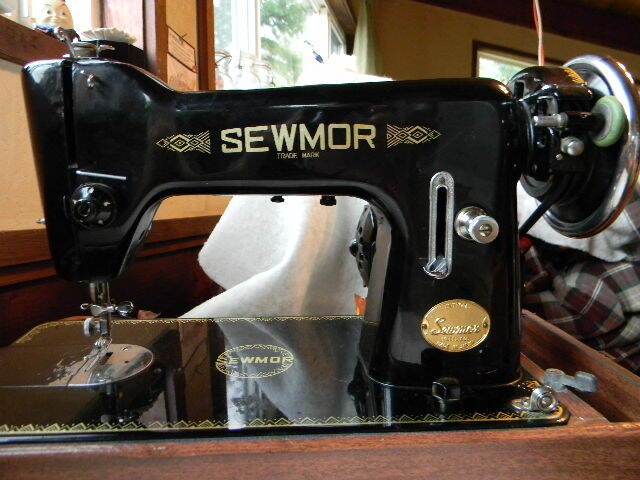 I've seen three different SEWMOR model numbers; the 202 which is a 15 clone, the 404 which is a cross between the 201 and 66, and the 606 which has two versions. Making a total of four. I'm partial to the Sewmors and want all four. Eventually. 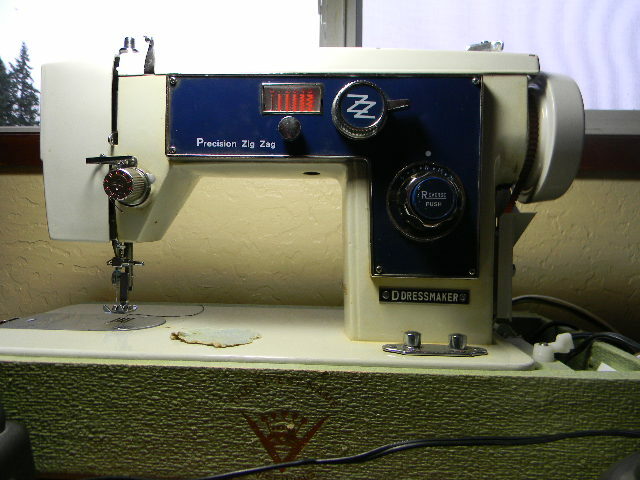 Dressmaker Precision Zig Zag sewing machine. Model 295, serial number 00050. No JA number on this one but a large "V" and "T" are stamped underneath. 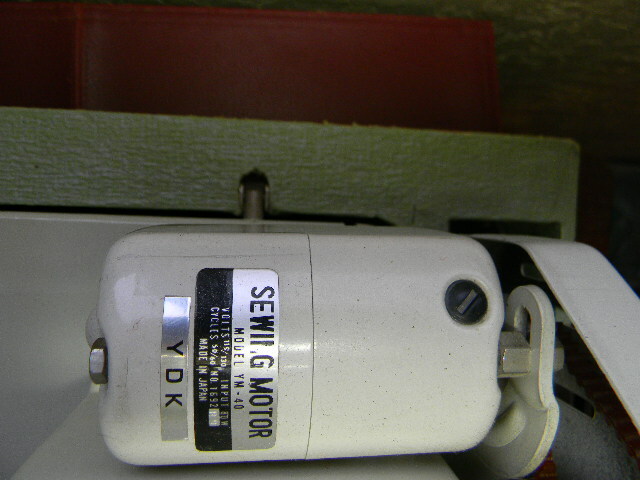 The motor is made by YDK, model YM40, 115-130 V/80 watts. This is the only machine that I have that has a made in Japan motor. The straight stitch sewing position for the needle is left. Joe, did you make the Dial 'n Sew all pretty yet? The Dressmaker doesn't come up on my screen. Yep, don't have any "after" pics yet. Working on it. Does the Sewmor 606 I was gonna buy from you look like the one cabbagepatchkid posted above? I don't remember. It looks like it is out of the same cookie cutter but the paint is much different. 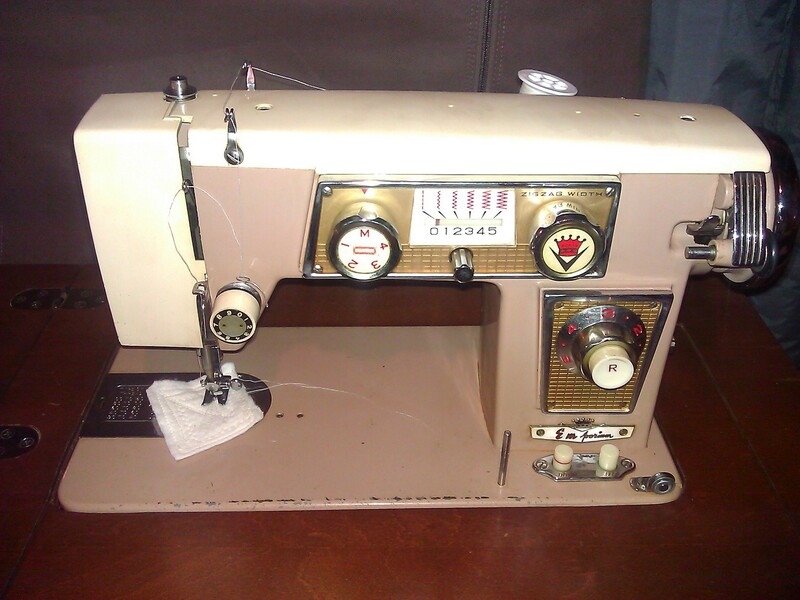 OK, just for Miriam, here's the Dial 'n Sew 516 all cleaned up and working. Still got some fine tuning to do, especially with the button hole setting knob, but she'll do SS and ZZ just fine. Joe does that have a camstack? I'm trying to justify that knob and lever on the left. That one sure doesn't have any glitz does it or is an extra lever and knob the glitz? Does the lever release something so the dial can turn? It is amazing how nice they look when they get a little cleaning.